HMI, SCADA, MES software and automation platform. VBASE Features. VBASE - the flexible automation platform. VBASE - what is it and where can it be used? 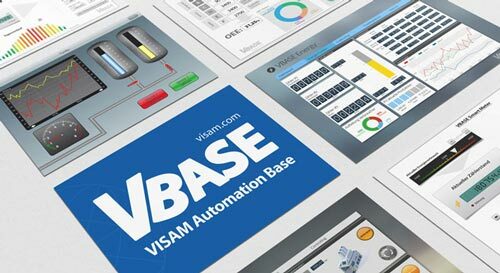 VBASE stands for "VISAM Automation Base" and is an branch-neutral and highly flexible process visualization and control system. The application possibilities of VBASE are almost unlimited. VBASE is at home where processes are visualized, data is collected and control commands must be exchanged with remote systems. In industrial automation, just like in professional building systems engineering. From automotive, to construction materials, to pharmaceuticals and chemicals - VBASE is not limited to a single sector. Project compatible for more than 15 years. VBASE is constantly being further developed. We place great value on the downward compatibility with older program versions and on the fact that you do not have to redesign your visualization time-consumingly. VBASE has been project-compliant for more than 15 years. Consistend development from HMI to control level. With the VBASE editor, you get a unified and consistent development environment, which supports you with the visualization and control of complex systems, as well as with simple HMI tasks with compact operating devices based on Windows CE. With the VISAM Touch Panel series (VTP), we have developed a HMI platform that perfectly complements VBASE. Compatible with approximately 200 fieldbuses and remotesystems. VBASE is independent of individual components and manufacturers. Rather, it relies on a comprehensive driver pool and communicates with all common protocols, fieldbuses and remote systems. The VBASE communication modules are constantly updated and extended to include drivers for new systems. This way, your HMI & SCADA software is also compatible with the next-generation control systems. At present, VBASE supports about 200 different systems - the trend is increasing. Open interface standards (e.g., OPC or TCP / IP) enable vertical communication from the field bus to the office area. Due to the modular design of the system, customer-specific adaptations can be implemented quickly and cost-effectively. Competent help and support free of charge! Support at VISAM is free of charge! It does not matter if you are already a customer or are still testing our software. Our competent support team is at your disposal by telephone, email or in our support forum.